BEIJING (Reuters) - China's desire to develop close ties with Iran will remain unchanged, regardless of the international situation, President Xi Jinping told the speaker of Iran's parliament, ahead of Thursday's visit to Beijing by Saudi Arabia's crown prince. Saudi Arabia's King Salman visited Beijing in 2017, and Saudi Crown Prince Mohammed bin Salman arrives on Thursday for a two-day visit. However, China has had to walk a fine line, as it also has close ties with Saudi Arabia's regional foe, Iran. "No matter how the international and regional situation changes, China's resolve to develop a comprehensive strategic partnership with Iran will remain unchanged," it paraphrased Xi as saying. 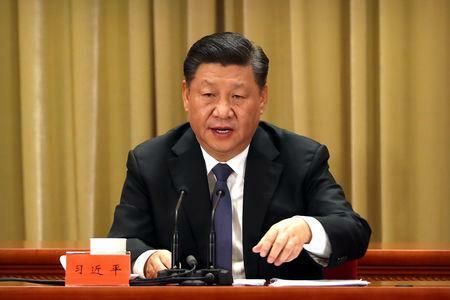 "We support Iran in playing a constructive role in maintaining regional peace and stability and are willing to closely communicate and coordinate on regional issues," Xi added. Washington's major European allies opposed a decision last year by U.S. President Donald Trump to abandon the Iran nuclear deal that included China and Russia, and lifted international sanctions on Iran, in return for curbs on its nuclear program.